For purposes of the publication count, only original articles, research letters, research papers and review articles in DHET-accredited or recognised journals may be submitted. The qualifying journal lists can be found here. 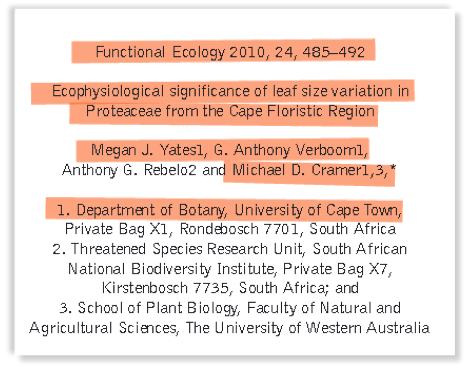 A photocopy of the first page of the article, reflecting the following: journal name, volume, year of publication, title of article, start-page AND end-page numbers, name(s) of author(s) and UCT author affiliation. Highlight the above information (see example below). If the above information does not appear on the first page, supply the relevant pages with the rest of the information (usually at the back of the article). If the first page of the article reflects only the abstract, provide the second page of the article as well. If the journal name does not appear on the published article, submit a copy of the journal cover, together with the table of contents page, highlighting the article being claimed. Hand-written information is not acceptable by the external auditors and will be returned to departments. Please do not highlight non-UCT authors and their affiliations. Hard copy documentation is necessary for the external auditors, who check all journal articles, to certify our claim. It is recommended that you do not supply original articles, as they will not be returned by the Research Office. Audited articles are archived for record-keeping purposes. Please ensure that data is captured electronically prior to submitting documentation. The eRA Programme is currently implementing the Converis system which will support this process. Any changes to the deadline arising from this implementation will be communicated in good time. For journals published outside South Africa, the editorial office of the journal should apply directly to the ISI Web of Science or IBSS for inclusion in the respective indices. South African journals may be proposed to DHET for inclusion in their South African list. A minimum of three consecutive issues must be published for journals with a quarterly or higher publication frequency and one issue for annual publications before submission for accreditation. Download the guidelines for the inclusion of journals to the DHET accredited lists.